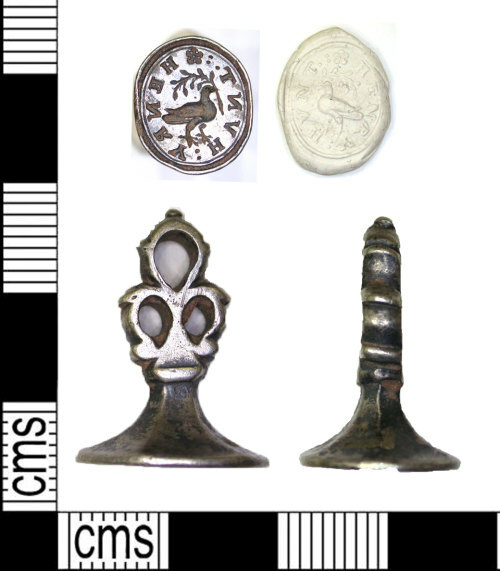 A complete Post-medieval silver seal matrix, possibly dating to 1794-1818. The base is oval with an image of a bird in the centre facing right with a sprig in its beak,above this is a five petalled flower, the inscription around the outside reads 'HENRY HVNT'. the base tapers to become a short hexagonal shaft which terminates in a flat open work trefoil shaped knop which has a single molded collar at its base. The finders have traced a Henry Hunt, 1794-1818, who had Loughborough connections and was involved in the Peterloo massacre. The imagery of the matrix suggests it could be of this date? Length 22mm, width 14mm, weight 6.14g.